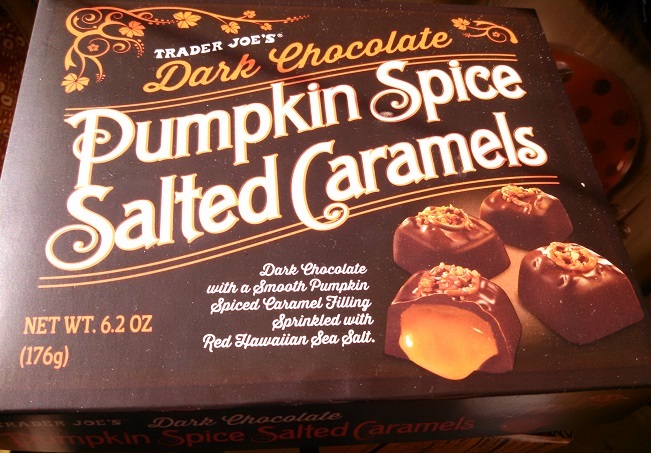 Trader Joe’s Pumpkin Madness continues, and we really have something unusual for you today. “But surely it couldn’t be more unusual than the Pumpkin Panettone we read about in the last post?”, I hear you asking, glancing at each other in puzzled concern. Price: $4.99 for a 6.2 oz box. The thing is – while Trader Joe’s pumpkin-filled panettone is clearly the product of a mind deranged by over-consideration of gourds, it is still a product easily recognizable and identifiable. Trader Joe’s Dark Choclate Pumpkin-Spice Sated Caramels, on the other hand, have no analog on this planet Earth. They certainly sound ordinary enough – salted caramels, sure those are delicious, dark chocolate, why not, and of course pumpkin-spice, because this is October and we can’t control ourselves. Yes the combination of these three components results in a truly intense and wholly new sort of taste completely unlike most chocolate bonbons I’ve experienced – a taste that is nearly savory, rather than sweet. The issue is that while “dark chocolate”, “pumpkin spice” and “salted caramel” sound good together on a box, they don’t really mingle with each other harmoniously on the tongue. Eating one of these is a little like wearing black-and-white checkerboard shorts with a plaid shirt. They components clash in bold and unusual ways. Let’s start with the salt. A little salt goes a long way, regardless of what you’re cooking, and doubly so when it comes to candy. When I tried Trader Joe’s Milk Chocolate Jumbles, I was really impressed with the elegance they showed with applying the salt – just a few grains place carefully on top. One glance on these caramels and it’s obvious that the same restraint was not shown. 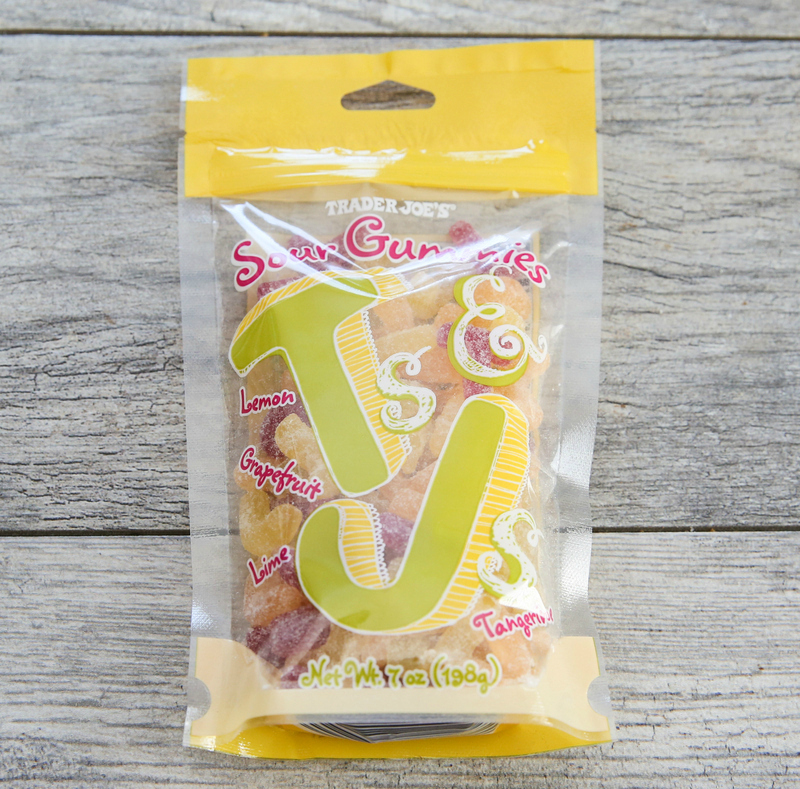 Each caramel is packed with a huge clump of vivid red Hawaiian sea salt. While I applaud the gorgeous color effect it has (and really, the presentation of the whole box couldn’t be classier), this is way too much salt. On first bite you’re immediately overwhelmed by a nearly painful burst of saltiness. The very next flavor you’ll notice is the rich, dark chocolate. I’ve said this before, and I’ll say it again, but dark chocolate should never simply be used as a substitute for milk chocolate. Yes, it sounds classier, looks better, and people will pay more money for it – but it simply isn’t the sort of light confection that milk chocolate is. In this case, Trader Joe’s is only using 55% dark chocolate in the candy shell, but in context the bitterness really comes to fore. This semi-bitter dark chocolate collides with the intense salt, and immediately starts a violent war over your tastebuds. This bitter/salty conflict is the start of the savory taste I was talking about above. What really drives it home, however, is the combination of “pumpkin-spices”. As we all know, “pumpkin-spice” is short-hand for a wide selection of strong spices used to turn pumpkin into something redolent and flavorful. In this case, TJ’s is using cinnamon, nutmeg, cloves, and ginger, and no shortage of it. Right as you bite into the caramel core, as you’re recovering from the wild ride of the outer shell, this combination of spices hits you so strongly that they nearly overpower the typical caramel sweetness. The result of all this is that for a moment, you might actually believe you’re biting in a slice of meat pie, or some other savory, salty, meaty treat. Only after a few moments, when the initial barrage of taste sensations die down, do you finally get to taste the long, mellow finish of the caramel – punctuated here and there a few parting sallies from the salt. On the back of the box, Trader Joe’s writes: “You think you’ll know what to expect, and yet, you’ll be pleasantly, pumpkinly surprised.” Surprised, certainly. Pleasantly is a matter of opinion. 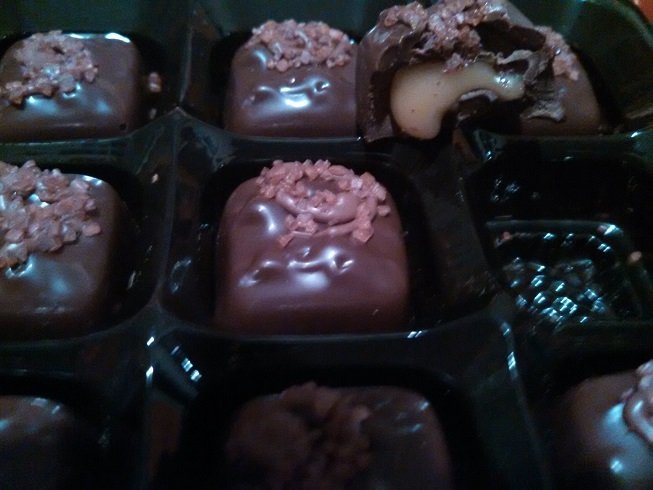 I will admit, after getting over the initial shock of the first few pieces, these caramels have started to grow on me. I’d hesitate to call them “good”, in the traditional sense of the word at least, but they are incredibly intriguing – a candy unlike anything else available in the store. While these aren’t for everyone, if you’re looking for something out of the ordinary to snack on and ruminate over, these are fascinating little morsels. If you need a nice little hostess gift (and you don’t want to bother with a panettone), you might be tempted to pick up a box of these. The presentation is certainly up to the job – but realize that you’ll be giving them something more challenging than delicious. Would I Recommend Them: Hesitantly, if I knew their palette well. Would I Buy Them Again: I’m still trying to come to terms with the first box. Final Synopsis: Extremely intense chocolates, with a nearly meaty taste. Does a chocolate-covered cracker become a cookie, or is it still just a cracker? Trader Joe’s never seems to run out of things to cover with dark chocolate, for good or ill. That said, chocolate of any stripe is pretty dang good, so I was intrigued by Trader Joe’s new Dark Chocolate Covered Honey Grahams with Sea Salt – little squares of graham cracker coated in a thick, dark chocolate shell and dusted with a trace of sea salt. What it is: Chocolate covered graham crackers with a sprinkling of salt. Price: $3.99 for 8 ounces. Worth it: Yes. Dark chocolate and sea salt go well together. Personally, I’m of the opinion that you need to be careful using dark chocolate. It’s really nice when used in the right context, but you can’t simply go around replacing it for milk chocolate in any confection that crosses your mine. Milk chocolate is a sweet, pleasurable treat. Dark chocolate on the other hand, especially when you get to 70% pure and above, is a refined nibble with a bitter edge. You can’t just mix it with peanut butter, for instance, and expect everything to turn out alright. Fortunately, these dark chocolate covered graham crackers fall squarely in the “tasty” column. All the parts here play really well together. The dark chocolate is doing the usual dark chocolate thing – semi-sweet as it melts on the tongue, with a long bitter back. Being clever sorts, Trader Joe’s doesn’t use a very high concentration of dark chocolate. Although they don’t tell us exactly how much on the label, it tastes like maybe 60% dark chocolate or so. Underneath this is the bit of graham cracker. Trader Joe’s alleges that there is some honey on the cracker, but it really doesn’t make much of an appearance. In fact, almost none of the graham cracker taste really shows up – unless you’re the sort that likes to hold it in your mouth until allllll the dark chocolate melts off before swallowing. Really, the crunchy cracker is just there for the body and texture, giving the little chocolate-covered cookie something for us to snap into. However, the real hero here isn’t the dark chocolate or the graham cracker, but the judicious use of sea salt. Although you’ll only find a few big grains of salt on each cookie, that’s all you really need. The semi-sweetness of the chocolate mingles delightfully with the high, salty notes and transforms the dark chocolate’s bitterness into complex, tongue-teasing treat. 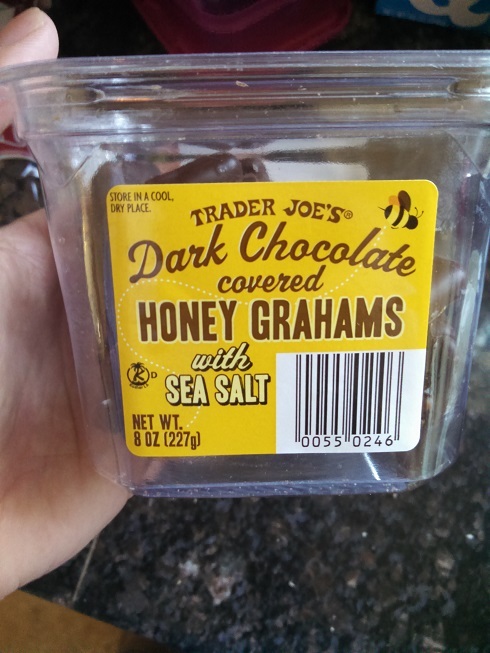 More than anything, Trader Joe’s Dark Chocolate Covered Honey Grahams with Sea Salt reminded me of Trader Joe’s previously released Milk Chocolate Jumbles. These were a very similar snack using toasted quinoa for the body and milk chocolate for the thick shell, but made the same use of a light dusting of sea salt. The Jumbles were quite a bit sweeter, but otherwise a very similar chocolate-and-salt taste. The take away? 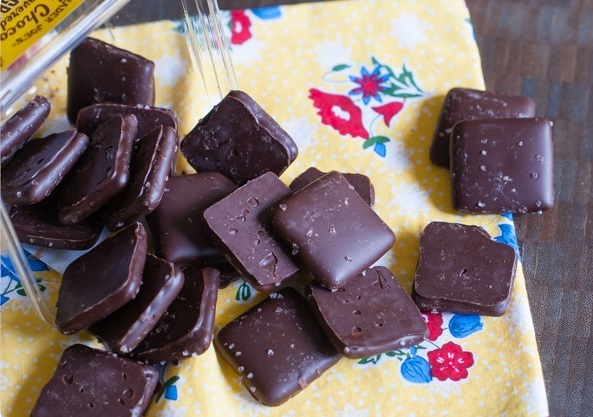 Putting a little sea salt on your chocolate is a downright delicious idea. Whatever else you do with it, a little fancy chocolate and salt marry very well together. In fact, as long as we’re mixing chocolate and salt, why not take this all the way to the top? It sort of makes me want to pick up another of Trader Joe’s great Fireworks Chocolate Bar and some of their Cypriot pyramid-shaped flake salt and just go nuts. Would I Recommend It: Sure – if you like chocolate-heavy snacks that are more than just chocolate. Would I Buy It Again: Maybe. I liked the toned down sweetness compared to the richer Jumbles. Final Synopsis: Another great pairing of chocolate and sea salt. I feel this is a missed opportunity to call them “Jumbo Jumbles”. Seems like something Trader Joe’s would go for. Ah yes, the jumble. One of the lazier forms of organization on the books. It’s right up there with the heap and the mess in terms of ways people don’t like their things to be. There’s just not much cachet to a jumble. So what lead Trader Joe’s to just sort of jumble some chocolate and stuff together instead of delivering it to the customer in a precisely thought through execution – like they did with their strictly ordered triple tiered chocolates? I must admit, I don’t actually know – but I will tell you that Trader Joe’s Milk Chocolate Jumbles are downright delicious. Aside from the intriguing name, what attracted me to these candy jumbles was the ingredient list. Listed right up in there, right next to milk chocolate and caramel is quinoa. Toasted quinoa. Also Himalayan salt. Okay, TJ, now you’ve got my attention. You may have dozens of chocolate-covered after-dinner treats available to me – but only one has quinoa in it. Depending on your viewpoint, that’s either a stroke of desperation or brilliance. Why in the world, after all, would you try to shoehorn quinoa into a chocolate confection filled with gooey caramel? Quinoa and chocolate occupy opposite ends of the nutrition spectrum. I would think that they would have annihilated each other when they came into contact. In fact, I wouldn’t be surprised if this was the first time anyone has ever tried mixing caramel and quinoa together. Well, I’ll tell you this much – all the hypothetical people who decided not to do this before – it’s your loss. The toasted quinoa is a delightful part of this little snack food. Before I get into the why’s and wherefores of that, though, we’d better take a look at our jumble as a whole. You might not be sure what you’re getting into at first glace. Any manner of strange and surprising items could be lurking beneath that rich, milk chocolate coating. It could easily be chewy, hard, salty, filled with hidden nuts, baked like a brittle or as hard and unyielding as an over-cooked cookie. You just can’t tell that much from such an ambiguous lump. The fact of the matter is, on your first bite your teeth will sink right into a sweet, dense core of caramel. There’s no hidden, solid substrate to this little trifle – it’s pure, pliable, yielding caramel all the way through. Or almost pure, I should say. This is where the toasted quinoa comes in. Little did I know that toasted quinoa tastes and acts pretty much just like toasted rice. Nothing of the distinctive taste and texture of quinoa remains – instead it has become a light, crispy, crunchy bit of pleasing texture teasing the tooth here and there and lending the jumble a bit of much needed body. Unlike toasted rice, the toasted quinoa is much smaller, and as a result it works much better in this small treat – never interrupting your bite, but just kind of sitting there, in your mouth, crunching up pleasantly between your teeth. While the quinoa is fine and completely inoffensive, the real star of the show is the sprinkling of Himalayan salt. Why it needs to be Himalayan salt, I don’t know – but I can tell you that it takes the jumble to a whole new level. If you’ve never tried salted caramel before, or salted chocolate, you’re missing out on one of life’s great flavor sensations. Nothing accentuates and compliments the rich sweetness of cream and sugar like a few well placed grains of salt, and here it adds an entire new level of richness to what would otherwise be a simple little treat. The only real problem, as far as I’m concerned is that the salt distribution on the jumbles is very erratic – some jumbles have no salt, while others have plenty. The jumbles without salt on them are fine and good – it’s just that the salted ones are what really make this worth picking up. 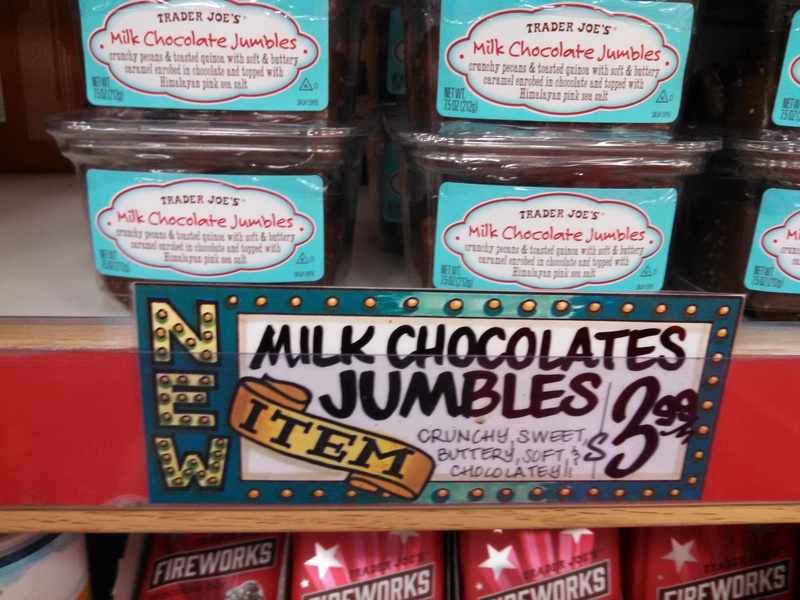 Trader Joe’s Milk Chocolate Jumbles are aimed at the buyer who is looking for a decadent chocolate treat without any of the pretension (and inflated price tag) that so often goes along with that. They’re certainly not going to make you any thinner, but if you’re looking for a novel new way to intake caramel and chocolate, these aren’t a bad choice. Would I Recommend Them: Yes, if you like really sweet sweets. Would I Buy Them Again: I would if my willpower was stronger. Final Synopsis: Don’t let the quinoa worry you – these are all about the salted caramel and chocolate. Cheap gimmick – or dynamite in a bag? You know what they say – once you’ve reviewed one novelty chocolate confection, you just can’t stop. Someone says that , I’m sure of it. 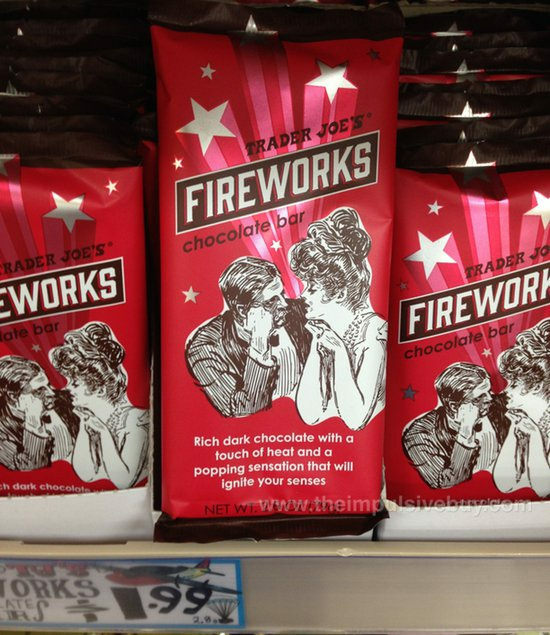 At any rate, this classic axiom lead me to pick up Trader Joe’s Fireworks Chocolate Bar – a real honest to goodness chocolate bar, except it’s dark chocolate and filled with Red Hot Pop Rocks. Or that’s how it tastes at least. This chocolate bar is Trader Joe’s entry into the amazing new world of chocolate bars with non-chocolate confections embedded I them. Confectioner Chuao started doing this a while back, coming out with such Willy Wonka-esque hybrids as chocolate and popcorn bits, chocolate and strawberry bits and, of course, chocolate and bacon bits. Trader Joe’s own crazy idea is to combine dark chocolate (although the exact percentage dark is left unspecified), combined with “popping candy” bits, chipotle chile, and cayenne pepper. The result is kind of crazy. When you first bite into the bar, yes, it tastes just like a low percentage dark chocolate bar, more sweet than bitter, smooth and of course chocolaty. But then things start exploding in your mouth and you get concerned. These, of course, are our “popping bits”, a generic name for what is essentially pop rocks. Ground up small enough that you will rarely encounter one of these crackling bits of sugar, they are nonetheless very noticeable, as your mouth gently hisses and snaps as the chocolate dissolves on the tongue. Secondary to this effect is the “fire” part of the “firecracker” chocolate. Although it contains, as previously stated, chipotle chile, pasilla chile and cayenne pepper, it’s not in sufficient quantities to light anyone’s mouth on fire. It is, however, plenty enough to give you a warm glow and tingle to go along with the nice bittersweet chocolate. Overall, it’s a pretty good effect – pulling your mind and your taste buds in at lest three directions at once as you feel and taste your way through this cavalcade of bittersweet, fiery explosions. This is really a chocolate bard to be savored in small bites, and let melt luxuriously onto the tongue. It may be the same size as any of TJ’s other chocolate bar, but you’ll derive many times the satisfaction from it. After the swing-and-miss dark chocolate and ginger confection I tried earlier this week, it’s a relief to see that they can also deliver something this good. You may not want to come back to this bar every time you feel a chocolate craving – but you’ll be doing yourself a favor if you pick it up at least once. Would I Recommend It: Yeah! 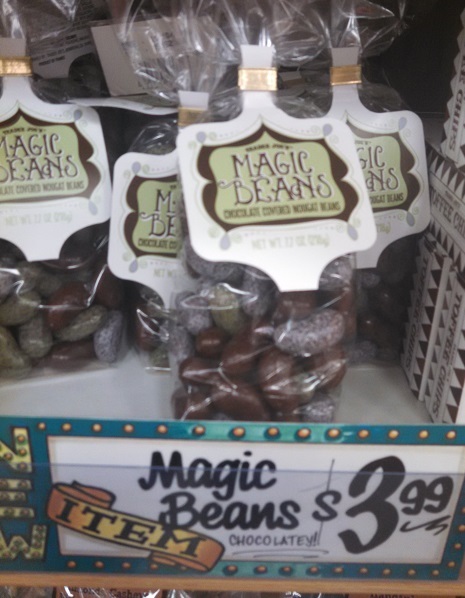 Don’t be afraid guys – Trader Joe’s is doing something pretty cool here. Would I Buy It Again: I’d definitely pick one up to share. Final Synopsis: Dark chocolate + pop rocks + chili pepper = a surprisingly good candy bar.